After a breakfast of sandwiches, we gathered our things and crossed the street, loading in to a brightly colored, windowless bus; it's as if the buses themselves are canvases. (Another lesson from Peru I learned - not personally - is that the traffic has the right of way; so watch yo'-self! Christina told us there was a museum in Costa Rica dedicated to victims of such ends.) The wind as we drove provided a beautiful breeze and the bus was alive with Peruvian music which is hard to describe... but it added to the energy you could feel as we passed through the city streets crowded with storefronts, Motos, mopeds, and pedestrians. We stopped in front of the tour agency where we picked up a few more passengers and a money exchange where we converted our American dollars for Peruvian Soles. This was pretty incredible for me as it was in my favor at 3.2 Sols to 1 US dollar; typically I loose money in an exchange as I usually convert my currency in favor of Euros. Everyone loaded back up on the bus and we made our way to a town square where we were dropped off. I wondered coming in to the trip if I was going to have to face eating something bizarre ... I prepared myself for just such a case by eating a, brace yourself, PB&J sandwich-half during our pre-trip training! If I could eat that, surely I could handle eating a jungle grub! Truth be told, my curiosity for having the full, authentic experience outweighed my comfort zone. You eat first and ask questions later! I learned that this "jungle grub" is actually the larvae of a certain beetle that lays its eggs in the heart of a palm tree and is considered a delicacy by Natives in the jungle. So for those who are done squirming and wondering, it tasted like meat and the texture reminded me a bit of a date at least in appearance (not as gooey.) We were taught in training to eat everything graciously, so I "took one for the team" and reached for a second ... I didn't have to fight any one off. Christina, our team leader, was a die-hard, eating the heads of both my grubs, something even the locals don't do! She said it was like crunchy chicken ... I took her word for it! We then loaded onto a boat with a thatch covered roof. 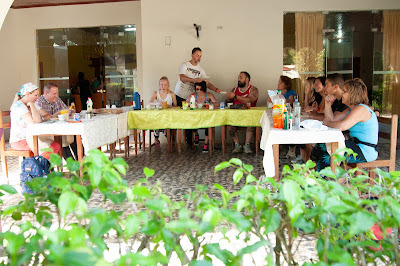 Maybe it was my nervousness of again being on the water ... piranha, anaconda, parasite infested waters to be exact ... but I would have liked to see people distribute their weight, eventually we did even out but at first I felt like every one was sitting on the same side and my heart was like "WHAAAAT?!" As we headed out on the waters, our guide pointed out a natural phenomenon, distinctly separated yet in one body, the brown waters of the Amazon collided with the blue of another river where they joined together. Our boat docked at a tribe of one native people, the Yahaus tribe. They greeted us by painting our face with red tribal paint from a fruit. (Every one looked so cute, I on the other hand was sweating profusely and looked like a murderous mess!) The chief(?) of their tribe greeted us in their native language and sang us a song. Then explained that they hunt monkeys with poisoness darts made from plant extracts. They allowed us to take turns blowing in to the gun, aiming at a wooden parrot. Any one who knows me, knows to STAY CLEAR!!!! I have no aim or coordination skills! Thankfully I had assistance holding and aiming the long pipe and only had to worry about mustering up enough breath to get the dart out! (Even in just that, I didn't have much faith in myself with my breathing history.) I was elated that I not only launched the dart, but it had hit the wooden parrot target and NOT an innocent bystander! 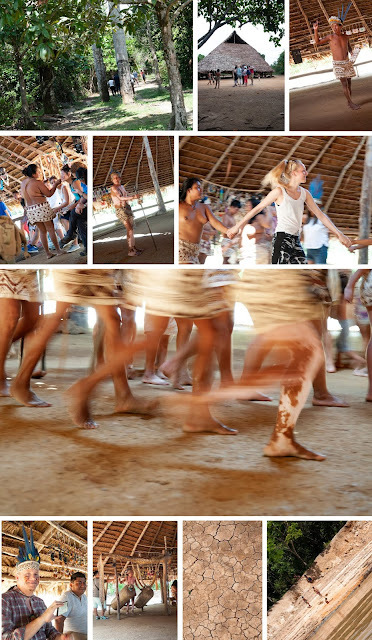 The natives then invited us to join in dance with them (which felt more like a bounced walk.) It was just so surreal to be experiencing it! We then were given the chance to purchase items hand-made by the people. I was disheartened to find out that rather than the money collectively supporting the tribe, the money went to whomever you purchased from. It made for a very overwhelming experience as mothers and children tried to put bracelets on your wrist and hold items in front of your face. I purchased two seed bracelets and a woven bag that was colorfully detailed with pink and orange (presumably dyed from fruits.) I hadn't intended on bringing much home with me, and I was feeling overwhelmed, so I stepped outside the hut after making my purchases. Children would still try to present you with their family's items, but it wasn't as many. We left the Yahuas tribe in their bold, red skirts and grass tops to make our way back up the river for our next stop. The Boras tribe had a steep stairway from the river bank to their marketplace hut. Perhaps I would have faced it more boldly had we not recently had an incident ... but I was moving around a bit more gingerly at this point! (I knew God had His hand on me, but I didn't feel a need to test it!) Walking up to the hut, we passed by trees that had images on them which was neat to see. The most striking thing I noticed about the Boras tribe was their beautiful skirts, and initially I hoped there might be an opportunity to purchase one ... until I got to feel just how comfortable it would be in their presentation. They explained to us that their skirts were made from the fibers of tree bark and were stained with the beautiful pattern. They were stylish, but stiff and not exactly cozy. A beautiful woman, with one eye, came by to paint our faces. I made eye contact with her and held a gaze, smiling, hoping that she sensed how lovely she is. The women were given two black lines while men were given three, like cat whiskers. The Boras tribe also explained how they make drums from hollowed out trees in a year-long process. The drums were on display beneath an arch that was draped with the skin of an anaconda. There was a large giving log that a group of men bounced on, each time the log hit the hardened dry soil it reverberated like a drum. Once again our team was invited to dance along. It was so surreal. And again we had the opportunity to make purchases. This time I bought a bracelet made from Anaconda skin, a small purse with seed beads, and a pair of earrings (I was unsure if these were made from bone or shell.) I was pretty devastated to see Christina and Julia had purchased the only two hammocks! I've been wanting one for a few years and it seemed so cool to be able to have a hand-made tribal hammock. Unfortunately it was a 2-hour hike one way for the woman to bring me one, time we were not afforded. We loaded back on our boat and set off. I was in awe at everyone's different purchases. I was so overwhelmed and rushed that I felt like there were so many great things I didn't see. Christina left the tribes, sharing with me that those were the people groups her heart longed to serve. She looked pretty radiant in all her tribal paint and authentic necklace. She bravely dropped her hand in to the Amazon, the cool water splashing in a trail as we sailed away. We set off again for a long (maybe 2 hour?) commute to our lodge for the buffet lunch. I had hopes it would be different than the staples of chicken/fish, rice, and yucca/bananas or plantains we had been regularly eating. Not that I didn't appreciate them, but I wondered if there were any other Peruvian flavors I could melt in to. We arrived and walked up wooden boards through the marshy bank, arriving at the lodge. A boy and girl sat out front clinging to tiny little birds; many of us stopped to "ooh" over them. The little boy was content to hang on to his feathered friend, but the young girl allowed her pet to hop on to Christina's perched finger. We were not able to linger long before we were rushed over to the lodge entrance. We had a schedule to keep. Lunch was coming out as we picked a seat, I was super excited for a salad-like dish, beans, and salsa. The salad was made from cucumbers, palm hearts, beets and eggs in some sort of citrusy dressing; (more) rice, beans, fish that was so tender, juicy, and meaty cooked with tomatoes, and a salsa of some sort in a spicy, tangy dressing. (Presumably made with the same fiery-hot, jungle pepper I had just subjected myself to, thanks for the "fruit" Little Andrew!😂) Bananas and orange halves completed the spread for a sweet ending. After we ate, we took a short walk through the jungle landscape where we came upon a SLOTH!!!!! Our guide climbed up in the tree and pried him lose from the branches so we could each take a turn holding him. It was so incredible! The whole time he seemed to be just looking for his tree. I could comically imagine him saying in a slow, low-tone voice "put meeee back in the treee pleeeease." Next our guide brought out a Caiman alligator ... He hissed and was not content to be passed around, so I was perfectly fine with skipping this opportunity. He ended up snapping at Little Andrew. Whose Dad was quite proud when he realized his son was OK. "It's just like being bitten by a cat" he jested. I mean getting snapped at by a Caiman is pretty epic I'd say! From there we arrived to the ANACONDA! A baby albeit. He had been brought to the lodge when he was injured in a fishing accident. The anaconda was pretty docile ... I had not held the Caiman, so I felt like I couldn't pass up two opportunities ... I not so bravely stood behind the anaconda and and stroked his skin with one finger. I was so nervous in the moment despite it's non-aggressive demeanor, that I didn't really get a chance to process what he felt like. We then made a brief stop on a platform where we could see a sugar cane press (not demonstrated) where they make liqueurs and healing tonics which you could, of course, purchase. 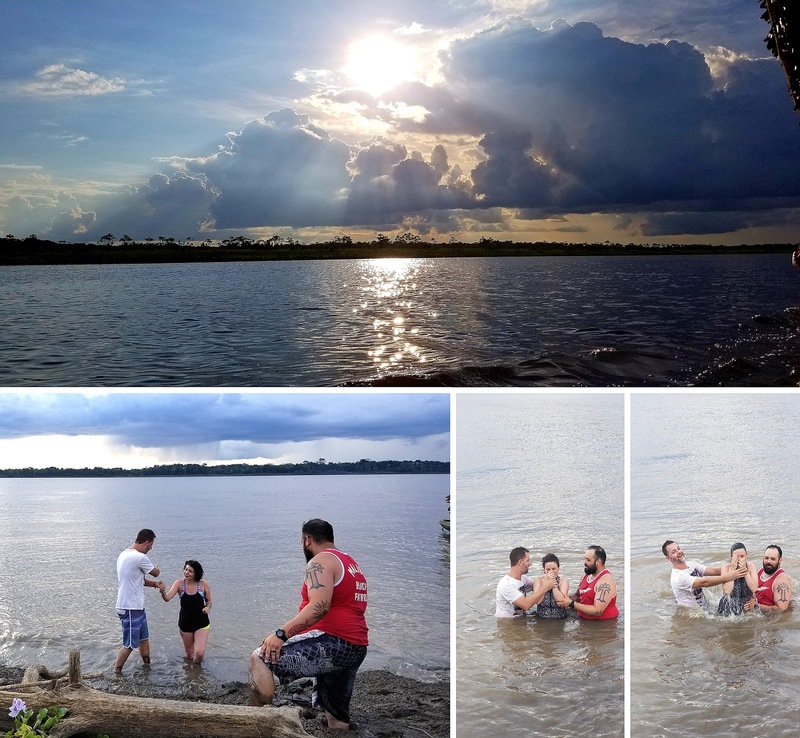 We needed to get going as we wanted to have time for the team's baptism and our guide wanted to make it back, off the Amazon, before dark. So we quickly made our way back to the lodge, and coralled like a herd into the hot bathrooms to change into our swimwear. We loaded back on our boat curious where the "safe place of the Amazon" was to be baptized. Imagining maybe a netted off beach area, just to keep certain things at bay? Nope! We arrived at a giant mound of mud where other boats had docked and visitors stood atop like explorers staking their land. We got off the boat to a huge surprise ... the mud from the shoreline swallowed our feet with an insatiable appetite, there was maybe one or two spots that were forgiving. It was hilarious to watch Jacob trying to get to his wife to assist in her baptism (this was her first time committing to the Lord in baptism!) as his 6' 1" figure seemed no threat to the mud, swallowing his leg to the kneecaps. I wish we would have had a bit more time to reflect while recommitting; but I wouldn't argue with a sunset deadline on the Amazon! The drive back was serene and beautiful, until the sun had set and it was getting dark and signs of our destination were not evident. I started wondering what happens in the Amazon at night that we were trying to avoid. 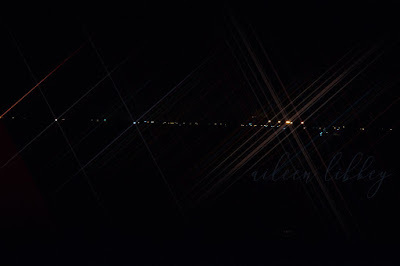 Eventually I spotted tiny pinholes of lights in the distance but they were on the opposite side of where we had crossed from, understandably because our boat was hugging the shoreline. I turned to Brooke for comfort in conversation, distracting myself. I loved the opportunity it gave me to hear her heart about this missions trip as it was not her first, though it was mine. I was so entrenched that I hadn't even realized we made it back! We made our way back past the familiar shoreline, this time without an appetizer of grubs ... and waited for our bus which arrived a few minutes later. I let my hair down to dry, blowing in the breeze. The city came alive at night. Fountains were lit with colorful orbs of light, fire dancers entertained at an intersection, our bus was loud with music ... it was so energizing even though it had been a long and beautiful day!